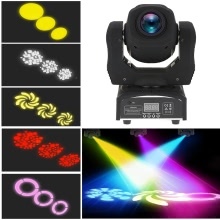 This 60W moving head stage light gives incredible light effects by projecting 8 patterns with different colors. What I want to emphasize is that it is 60 watts, which means it is super bright to definitely highlight the entertainment. It works perfectly with sound activation, automatic, DMX 512 and master slave. I can sure it is the best party light solution ever. Super bright 60W moving head stage light can create 8 patterns with red, yellow, blue, green, orange, roseo, light blue and white colors. Compact, safe, and reliable design. High-quality stepper motors allow for fast, smooth, and accurate movements. Sound-activated: Very sensitive to music rhythm. 540° Pan and 190° Tilt. Automatic error correction. Smooth electronic dimming from 0 – 100% (when used with DMX). Put on the ground or mount it on a wall(the mounting accessories are provided), Flexible for indoor use.